For other uses, see Beef (disambiguation). Wagyu cattle are an example of a breed raised primarily for beef. Beef as part of a meal with potatoes and spinach. Beef is the culinary name for meat from cattle, particularly skeletal muscle. Humans have been eating beef since prehistoric times. Beef is a source of high-quality protein and nutrients. Beef skeletal muscle meat can be used as is by merely cutting into certain parts roasts, short ribs or steak (filet mignon, sirloin steak, rump steak, rib steak, rib eye steak, hanger steak, etc. ), while other cuts are processed (corned beef or beef jerky). Trimmings, on the other hand, are usually mixed with meat from older, leaner (therefore tougher) cattle, are ground, minced or used in sausages. The blood is used in some varieties called blood sausage. Other parts that are eaten include other muscles and offal, such as the oxtail, liver, tongue, tripe from the reticulum or rumen, glands (particularly the pancreas and thymus, referred to as sweetbread), the heart, the brain (although forbidden where there is a danger of bovine spongiform encephalopathy, BSE, commonly referred to as mad cow disease), the kidneys, and the tender testicles of the bull (known in the United States as calf fries, prairie oysters, or Rocky Mountain oysters). Some intestines are cooked and eaten as is, but are more often cleaned and used as natural sausage casings. The bones are used for making beef stock. Beef from steers and heifers is similar. Depending on economics, the number of heifers kept for breeding varies. The meat from older bulls, because it is usually tougher, is frequently used for mince (known as ground beef in the United States). Cattle raised for beef may be allowed to roam free on grasslands, or may be confined at some stage in pens as part of a large feeding operation called a feedlot (or concentrated animal feeding operation), where they are usually fed a ration of grain, protein, roughage and a vitamin/mineral preblend. Beef is the third most widely consumed meat in the world, accounting for about 25% of meat production worldwide, after pork and poultry at 38% and 30% respectively. In absolute numbers, the United States, Brazil, and the People's Republic of China are the world's three largest consumers of beef; Uruguay, however, has the highest beef and veal consumption per capita, followed by Argentina and Brazil. According to the data from OECD, the average Uruguayan ate over 42 kg (93 lb) of beef or veal in 2014, representing the highest beef/veal consumption per capita in the world. In comparison, the average American consumed only about 24 kg (53 lb) beef or veal in the same year, while African countries, such as Mozambique, Ghana, and Nigeria, consumed the least beef or veal per capita. In 2015, the world's largest exporters of beef were India, Brazil and Australia. Beef production is also important to the economies of Uruguay, Canada, Paraguay, Mexico, Argentina, Belarus and Nicaragua. The word beef is from the Latin bōs, in contrast to cow which is from Middle English cou (both words have the same Indo-European root *gʷou-). After the Norman Conquest, the French-speaking nobles who ruled England naturally used French words to refer to the meats they were served. Thus, various Anglo-Saxon words were used for the animal (such as nēat, or cu for adult females) by the peasants, but the meat was called boef (ox) (Modern French bœuf) by the French nobles — who did not often deal with the live animal — when it was served to them. This is one example of the common English dichotomy between the words for animals (with largely Germanic origins) and their meat (with Romanic origins) that is also found in such English word-pairs as pig/pork, deer/venison, sheep/mutton and chicken/poultry (also the less common goat/chevon). Beef is cognate with bovine through the Late Latin bovīnus. People have eaten the flesh of bovines from prehistoric times; some of the earliest known cave paintings, such as those of Lascaux, show aurochs in hunting scenes. People domesticated cattle around 8000 BC to provide ready access to beef, milk, and leather. Most cattle originated in the Old World, with the exception of bison hybrids, which originated in the Americas. Examples include the Wagyū from Japan, Ankole-Watusi from Egypt, and longhorn Zebu from the Indian subcontinent. It is unknown exactly when people started cooking beef. Cattle were widely used across the Old World as draft animals (oxen), for milk, or specifically for human consumption. With the mechanization of farming, some breeds were specifically bred to increase meat yield, resulting in Chianina and Charolais cattle, or to improve the texture of meat, giving rise to the Murray Grey, Angus, and Wagyū. Some breeds have been selected for both meat and milk production, such as the Brown Swiss (Braunvieh). In the United States, the growth of the beef business was largely due to expansion in the Southwest. Upon the acquisition of grasslands through the Mexican–American War of 1848, and later the expulsion of the Plains Indians from this region and the Midwest, the American livestock industry began, starting primarily with the taming of wild longhorn cattle. Chicago and New York City were the first to benefit from these developments in their stockyards and in their meat markets. Beef cattle are raised and fed using a variety of methods, including feedlots, free range, ranching, backgrounding and Intensive animal farming. Beef is first divided into primal cuts, pieces of meat initially butchering. These are basic sections from which steaks and other subdivisions are cut. 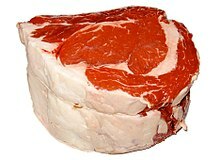 The term "primal cut" is quite different from "prime cut", used to characterize cuts considered to be of higher quality. Since the animal's legs and neck muscles do the most work, they are the toughest; the meat becomes more tender as distance from hoof and horn increases. Different countries and cuisines have different cuts and names, and sometimes use the same name for a different cut; for example, the cut described as "brisket" in the United States is from a significantly different part of the carcass than British brisket. Beef rump steak on grill pan, cooked to medium rare. Certified Angus Beef (CAB) in Canada and the United States is a specification-based, branded-beef program which was founded in 1978 by Angus cattle producers to increase demand for their breed of cattle, by promoting the impression that Angus cattle have consistent, high-quality beef with superior taste. The brand is owned by the American Angus Association and its 35,000 rancher members. The terms Angus Beef or Black Angus Beef are loosely and commonly misused or confused with CAB; this is especially common in the food service industry. The brand or name Certified Angus Beef cannot be legally used by an establishment that is not licensed to do so. In the UK the equivalent is Aberdeen Angus, marketed as higher quality and associated with stricter animal welfare rules. Notable for the herd being free of BSE during the BSE epidemic in the UK. Similar schemes are used elsewhere as in Certified Angus Beef in Ireland. Certified Hereford Beef is beef certified to have come from Hereford cattle. Kobe beef is pure Tajima-gyu breed bull that was born, raised, and slaughtered solely within the Hyogo prefecture. Very limited amounts of Kobe are exported. Some certifications are based upon the way the cattle are treated, fed and/or slaughtered. Grass-fed beef cattle have been raised exclusively on forage. Grain-fed beef cattle are raised primarily on forage, but are "finished" in a feedlot. Halal beef has been certified to have been processed in a prescribed manner in accordance with Muslim dietary laws. Organic beef is produced without added hormones, pesticides, or other chemicals, though requirements for labeling it organic vary widely. Some standards are based upon the inspected quality of the meat after slaughter. Countries regulate the marketing and sale of beef by observing criteria post-slaughter and classifying the observed quality of the meat. This classification, sometimes optional, can suggest a market demand for a particular animal's attributes and therefore the price owed to the producer. To improve tenderness of beef, it is often aged (i.e., stored refrigerated) to allow endogenous proteolytic enzymes to weaken structural and myofibrillar proteins. Wet aging is accomplished using vacuum packaging to reduce spoilage and yield loss. Dry aging involves hanging primals (usually ribs or loins) in humidity-controlled coolers. Outer surfaces dry out and can support growth of molds (and spoilage bacteria, if too humid), resulting in trim and evaporative losses. Evaporation concentrates the remaining proteins and increases flavor intensity; the molds can contribute a nut-like flavor. After two to three days there are significant effects. The majority of the tenderizing effect occurs in the first 10 days. Boxed beef, stored and distributed in vacuum packaging, is, in effect, wet aged during distribution. Premium steakhouses dry age for 21 to 28 days or wet age up to 45 days for maximum effect on flavor and tenderness. Meat from less tender cuts or older cattle can be mechanically tenderized by forcing small, sharp blades through the cuts to disrupt the proteins. Also, solutions of exogenous proteolytic enzymes (papain, bromelin or ficin) can be injected to augment the endogenous enzymes. Similarly, solutions of salt and sodium phosphates can be injected to soften and swell the myofibrillar proteins. This improves juiciness and tenderness. Salt can improve the flavor, but phosphate can contribute a soapy flavor. These methods are applicable to all types of meat and some other foodstuffs. Roast beef cooked under high heat. Grilling is cooking the beef over or under a high radiant heat source, generally in excess of 340 °C (650 °F). This leads to searing of the surface of the beef, which creates a flavorsome crust. In Australia, New Zealand, the United States, Canada, the UK, Germany and The Netherlands, grilling, particularly over charcoal, is sometimes known as barbecuing, often shortened to "BBQ". When cooked over charcoal, this method can also be called charbroiling. Barbecue refers to a technique of cooking that involves cooking meat for long periods of time at low temperatures with smoke from a wood fire. Broiling is a term used in North America. It is similar to grilling, but with the heat source always above the meat. Elsewhere this is considered a way of grilling. Griddle Meat may be cooked on a hot metal griddle. A little oil or fat may be added to inhibit sticking; the dividing line when the method becomes shallow frying is not well-defined. Roasting is a way of cooking meat in a hot oven, producing roast beef. Liquid is not usually added; the beef may be basted by fat on the top, or by spooning hot fat from the oven pan over the top. A gravy may be made from the cooking juices, after skimming off excess fat. Roasting is suitable for thicker pieces of meat; the other methods listed are usually for steaks and similar cuts. Beef can be cooked to various degrees, from very rare to well done. The degree of cooking corresponds to the temperature in the approximate center of the meat, which can be measured with a meat thermometer. Beef can be cooked using the sous-vide method, which cooks the entire steak to the same temperature, but when cooked using a method such as broiling or roasting it is typically cooked such that it has a "bulls eye" of doneness, with the least done (coolest) at the center and the most done (warmest) at the outside. Meat can be cooked in boiling oil, typically by shallow frying, although deep frying may be used, often for meat enrobed with breadcrumbs as in milanesas. Larger pieces such as steaks may be cooked this way, or meat may be cut smaller as in stir frying, typically an Asian way of cooking: cooking oil with flavorings such as garlic, ginger and onions is put in a very hot wok. Then small pieces of meat are added, followed by ingredients which cook more quickly, such as mixed vegetables. The dish is ready when the ingredients are 'just cooked'. Moist heat cooking methods include braising, pot roasting, stewing and sous-vide. These techniques are often used for cuts of beef that are tougher, as these longer, lower-temperature cooking methods have time to dissolve connecting tissue which otherwise makes meat remain tough after cooking. simmering meat, whole or cut into bite-size pieces, in a water-based liquid with flavorings. This technique may be used as part of pressure cooking. cooking meats, in a covered container, with small amounts of liquids (usually seasoned or flavored). Unlike stewing, braised meat is not fully immersed in liquid, and usually is browned before the oven step. Sous-vide, French for "under vacuum", is a method of cooking food sealed in airtight plastic bags in a water bath for a long time—72 hours is not unknown—at an accurately determined temperature much lower than normally used for other types of cooking. The intention is to maintain the integrity of ingredients and achieve very precise control of cooking. Although water is used in the method, only moisture in or added to the food bags is in contact with the food. Beef roasted with vinegar and sliced with spiced paste, often called "cold beef". Meat has usually been cooked in water which is just simmering, such as in stewing; higher temperatures make meat tougher by causing the proteins to contract. Since thermostatic temperature control became available, cooking at temperatures well below boiling, 52 °C (126 °F) (sous-vide) to 90 °C (194 °F) (slow cooking), for prolonged periods has become possible; this is just hot enough to convert the tough collagen in connective tissue into gelatin through hydrolysis, with minimal toughening. With the adequate combination of temperature and cooking time, pathogens, such as bacteria will be killed, and pasteurization can be achieved. Because browning (Maillard reactions) can only occur at higher temperatures (above the boiling point of water), these moist techniques do not develop the flavors associated with browning. Meat will often undergo searing in a very hot pan, grilling or browning with a torch before moist cooking (though sometimes after). Beef can be cooked quickly at the table through several techniques. In hot pot cooking, such as shabu-shabu, very thinly sliced meat is cooked by the diners at the table by immersing it in a heated pot of water or stock with vegetables. In fondue bourguignonne, diners dip small pieces of beef into a pot of hot oil at the table. Both techniques typically feature accompanying flavorful sauces to complement the meat. Steak tartare is a French dish made from finely chopped or ground (minced) raw meat (often beef). More accurately, it is scraped so as not to let even the slightest of the sinew fat get into the scraped meat. It is often served with onions, capers, seasonings such as fresh ground pepper and Worcestershire sauce, and sometimes raw egg yolk. The Belgian or Dutch dish filet américain is also made of finely chopped ground beef, though it is seasoned differently, and either eaten as a main dish or can be used as a dressing for a sandwich. Kibbeh nayyeh is a similar Lebanese and Syrian dish. And in Ethiopia, a ground raw meat dish called tire siga or kitfo is eaten (upon availability). Carpaccio of beef is a thin slice of raw beef dressed with olive oil, lemon juice and seasoning. Often, the beef is partially frozen before slicing to allow very thin slices to be cut. Yukhoe is a variety of hoe, raw dishes in Korean cuisine which is usually made from raw ground beef seasoned with various spices or sauces. The beef part used for yukhoe is tender rump steak. For the seasoning, soy sauce, sugar, salt, sesame oil, green onion, and ground garlic, sesame seed, black pepper and juice of bae (Korean pear) are used. The beef is mostly topped with the yolk of a raw egg. Beef curry in Dhaka, Bangladesh. Bresaola is an air-dried, salted beef that has been aged about two to three months until it becomes hard and a dark red, almost purple, colour. It is lean, has a sweet, musty smell and is tender. It originated in Valtellina, a valley in the Alps of northern Italy's Lombardy region. Bündnerfleisch is a similar product from neighbouring Switzerland. Chipped beef is an American industrially produced air-dried beef product, described by one of its manufacturers as being "similar to bresaola, but not as tasty." Beef jerky is dried, salted, smoked beef popular in the United States. Biltong is a cured, salted, air dried beef popular in South Africa. Pastrami is often made from beef; raw beef is salted, then partly dried and seasoned with various herbs and spices, and smoked. Corned beef is a cut of beef cured or pickled in a seasoned brine. The corn in corned beef refers to the grains of coarse salts (known as corns) used to cure it. The term corned beef can denote different styles of brine-cured beef, depending on the region. Some, like American-style corned beef, are highly seasoned and often considered delicatessen fare. Spiced beef is a cured and salted joint of round, topside, or silverside, traditionally served at Christmas in Ireland. It is a form of salt beef, cured with spices and saltpetre, intended to be boiled or broiled in Guinness or a similar stout, and then optionally roasted for a period after. There are various other recipes for pickled beef. Sauerbraten is a German variant. A pamphlet protesting against the practice of cow slaughter. Most Indic religions do not appreciate killing cattle and eating beef. They consider the cow to be a god. Bovines have a sacred status in India especially the cow, from the idealization due to their provision of sustenance for families. Bovines are generally considered to be integral to the landscape. In Hinduism, the entire cosmic creation is considered to be sacred and are venerated like celestial bodies such as sun, moon to fig trees and rivers like Ganga river, Saraswati river, etc. India as a developing country, many of its rural area economies depend upon cattle farming, hence they have been revered in the society. From Vedic period, the role of cattle, especially cows, as a source of milk, and dairy products, and their relative importance in transport services and farming like ploughing, row planting, ridging, and weeding made people to revere the importance of cow in their daily lives, and this rose with the advent of Jainism and Gupta period. In medieval India, Maharaja Ranjit Singh issued proclamation on stopping cow slaughter as it is a sentimental issue. Conflicts over cow slaughter often have sparked religious riots that have led to loss of human life and in an 1893 riot alone, more than 100 people were killed for the cause. A. N. Bose in Social and Rural Economy of Northern India says any taboo or the cow worship itself is a relatively recent development in India. The sacred white Cow is considered as the abode of crores of 33 type Hindu Deities. Products of Cow's milk like curd, butter, cheese, milk sweets are sold commercially and used in religious rituals. For religious reasons the ancient Egyptian priests also refrained from consuming beef. Buddhists and Sikhs are also against wrongful slaughtering of animals but they don't have a wrongful eating doctrine. In the Indigenous American tradition a white buffalo calf is considered sacred, they call it Pte Ska Win (White Buffalo Calf Woman). During the season of Lent, Orthodox Christians and Catholics give up all meat and poultry (as well as dairy products and eggs) as a religious act. Observant Jews and Muslims may not eat any meat or poultry which has not been slaughtered and treated in conformance with religious laws. India is one of the biggest exporters of buffalo meat. Though some states of India impose various types of prohibition on beef prompted by religious aspects. Certain Hindu castes and sects avoid beef from their diets. Article 48 of the Constitution of India mandates the state may take steps for preserving and improving the bovine breeds, and prohibit the slaughter, of cows and calves and other milch and draught cattle. Article 47 of the Constitution of India provides states must raise the level of nutrition and the standard of living and to improve public health as among its primary duties, based on this a reasonableness in slaughter of common cattle was instituted, if the animals ceased to be capable of breeding, providing milk, or serving as draught animals. The overall mismanagement of India's common cattle is dubbed in academic fields as "India's bovine burden." In 2017 as a part of Hindutva movement, a rule against the slaughter of cattle and the eating of beef was signed into law by presidential assent as a modified version of Prevention of Cruelty to Animals Act, 1960. The law was later withdrawn after severe criticism from various corners including India's Supreme Court. Existing meat export policy in India prohibits the export of beef (meat of cow, oxen and calf). Bone-in meat, a carcass, or half carcass of buffalo is also prohibited from export. Only the boneless meat of buffalo, meat of goat and sheep and birds is permitted for export. In 2017, India sought a total "beef ban" and Australian market analysts predicted that this would create market opportunities for leather traders and meat producers there and elsewhere. Their prediction estimated a twenty percent shortage of beef and a thirteen percent shortage of leather in the world market. In 2003, Cuba banned cow slaughter due to severe shortage of milk and milk products. Beef is a source of complete protein and it is a rich source (20% or more of the Daily Value, DV) of Niacin, Vitamin B12, iron and zinc. Red meat is the most significant dietary source of carnitine and, like any other meat (pork, fish, veal, lamb etc. ), is a source of creatine. Creatine is converted to creatinine during cooking. Excessive consumption of red processed meat is known to increase the risk of bowel cancer and some other cancers. The Harvard School of Public Health recommends consumers eat red meat sparingly as it has high levels of undesirable saturated fat. This recommendation is not without controversy, though. Another study from The Harvard School of Public Health appearing in Circulation (journal) found "Consumption of processed meats, but not red meats, is associated with higher incidence of coronary heart disease and diabetes mellitus." This finding tended to confirm an earlier meta-analysis of the nutritional effects of saturated fat in The American Journal of Clinical Nutrition which found "[P]rospective epidemiologic studies showed that there is no significant evidence for concluding that dietary saturated fat is associated with an increased risk of coronary heart disease or cardiovascular disease. More data are needed to elucidate whether cardiovascular disease risks are likely to be influenced by the specific nutrients used to replace saturated fat." Some cattle raised in the United States feed on pastures fertilized with sewage sludge. Elevated dioxins may be present in meat from these cattle. January 2011, One Great Burger expands recall. February 2011, American Food Service, a Pico Rivera, Calif. establishment, is recalling approximately 3,170 pounds (1,440 kg) of fresh ground beef patties and other bulk packages of ground beef products that may be contaminated with E. coli O157:H7. March 2011, 14,000 pounds (6,400 kg) beef recalled by Creekstone Farms Premium Beef due to E. coli concerns. April 2011, National Beef Packaging recalled more than 60,000 pounds (27,000 kg) of ground beef due to E. coli contamination. May 2011, Irish Hills Meat Company of Michigan, a Tipton, Mich., establishment is recalling approximately 900 pounds (410 kg) of ground beef products that may be contaminated with E. coli O157:H7. September 2011, Tyson Fresh Meats recalled 131,100 pounds (59,500 kg) of ground beef due to E. coli contamination. December 2011, Tyson Fresh Meats recalled 40,000 pounds (18,000 kg) of ground beef due to E. coli contamination. January 2012, Hannaford Supermarkets recalled all ground beef with sell by dates 17 December 2011 or earlier. September 2012, XL Foods recalled more than 1800 products believed to be contaminated with E. coli 0157:H7. The recalled products were produced at the company's plant in Brooks, Alberta, Canada; this was the largest recall of its kind in Canadian History. In 1984, the use of meat and bone meal in cattle feed resulted in the world's first outbreak of bovine spongiform encephalopathy (BSE or, colloquially, mad cow disease) in the United Kingdom. In May 2003, after a cow with BSE was discovered in Alberta, Canada, the American border was closed to live Canadian cattle, but was reopened in early 2005. In June 2005, Dr. John Clifford, chief veterinary officer for the United States Department of Agriculture animal health inspection service, confirmed a fully domestic case of BSE in Texas. Clifford would not identify the ranch, calling that "privileged information." The 12-year-old animal was alive at the time when Oprah Winfrey raised concerns about cannibalistic feeding practices on her show which aired 16 April 1996. In 2010, the EU, through the European Food Safety Authority (EFSA), proposed a roadmap to gradually lift the restrictions on the feed ban. EU Regulation No 999/2001 had outlined a complete ban on feeding mammal-based products to cattle. A regulation that modified Annex IV of 999/2001, was published in 2013 that allowed for certain milk, fish, eggs, and plant-fed farm animal products to be used. ^ Piatti-Farnell, Lorna (2013). Beef: A Global History. London: Reaktion Books. p. 7. ISBN 978-1780231174 – via EBL Reader. In prehistoric times, our ancestors were known to have hunted aurochs, a type of wild—and rather ferocious—cattle that were the ancestor to modern livestock. ^ Oh, Mirae; Kim, Eun-Kyung; Jeon, Byong-Tae; Tang, Yujiao (2016). "Chemical compositions, free amino acid contents and antioxidant activities of Hanwoo (Bos taurus coreanae) beef by cut". Meat Science. 119: 16–21. doi:10.1016/j.meatsci.2016.04.016. PMID 27115864. Beef is one of the main animal food resources providing high-quality protein and essential nutrients, including essential amino acids, unsaturated fatty acids, minerals, and vitamins, for human consumption. ^ Schweihofer, Jeannine and Buskirk, Dan (10 April 2014) Do steers or heifers produce better beef?. Michigan State University. ^ Raloff, Janet (31 May 2003). Food for Thought: Global Food Trends. Science News. ^ Raghavan, TCA Sharad (10 August 2015). "India on top in exporting beef". The Hindu. India. Retrieved 7 October 2016. ^ Harper, Douglas. "beef". Online Etymology Dictionary. ^ "Beef". The Free Online Dictionary, Thesaurus and Encyclopedia. Thefreedictionary.com. Retrieved 18 December 2011. ^ The American Heritage Dictionary of the English Language, Fourth Edition, 2000: beef. ^ "Beef". The American Heritage College Dictionary, 4th ed. ^ "Late Neolithic megalithic structures at Nabta Playa". Archived from the original on 13 February 2008. Retrieved 27 February 2008. ^ "History of Cattle Breeds". Archived from the original on 27 April 2007. Retrieved 17 April 2007. ^ Horowitz, Roger (2006). Putting Meat on the American Table: Taste, Technology, Transformation. Baltimore: The Johns Hopkins University Press. ISBN 0801882419. ^ "Certified Angus Beef in Ireland". Angus producer group. Retrieved 2 March 2014. ^ "Exported Beef". Kobe Beef Marketing & Distribution Promotion Association. Archived from the original on 11 October 2014. ^ "Protected Designation of Origin (PDO)/Protected Geographical Indication (PGI)". European Commission — Agriculture and Rural Development. Archived from the original on 18 August 2007. Retrieved 10 August 2007. ^ "Is a Halal food market boom on its way?". 27 September 2013. Retrieved 3 October 2013. ^ "Dried Beef Products". Hormel. Archived from the original on 11 March 2007. Retrieved 3 September 2008. ^ Bankim Chandra Chatterji (1940). Letters on Hinduism. M.M. Bose. ^ Owen Cole; V P Hermant Kanit (25 June 2010). Hinduism - An Introduction. Hodder & Stoughton. p. 43. ISBN 978-1-4441-3100-0. ^ "Holy Cows: Hinduism's Blessed Bovines". Hinduism.about.com. Retrieved 2 March 2014. ^ "Switzerland loves its cows. But unlike India, there is no merging of the bovine and divine". The Wire. Retrieved 2 April 2017. ^ Chatterjee, Suhas (1998). Indian Civilization and Culture. M.D. Publications Pvt. Ltd. p. 232. ISBN 978-81-7533-083-2. ^ "The cow keepers: Some cattle vigilante groups operating in Delhi and neighbouring states". 11 October 2015. ^ Kenneth F. Kiple (30 April 2007). A Movable Feast: Ten Millennia of Food Globalization. Cambridge University Press. pp. 53+. ISBN 978-1-139-46354-6. ^ "Milking beef issue could tear social fabric". 28 May 2017. ^ Safi, Michael (5 April 2017). "Muslim man dies in India after attack by Hindu 'cow protectors'". The Guardian. ^ "'Women raped in fatal attack over beef'". 12 September 2016 – via www.bbc.com. ^ Doshi, Vidhi (6 June 2017). "To protest Modi, these Indians are cooking beef in public". The Washington Post. ^ "Holy cow: World's 2nd-largest beef exporter may ban cattle slaughter - FarmIreland.ie". independent.ie. ^ "Explained: Holiness of the Cow and Controversy Over Beef-Eating In Ancient India". Indian Express. 8 June 2015. ^ "The Hindu : Beef eating: strangulating history". www.thehindu.com. ^ John R. K. Robson (1980). Food, Ecology, and Culture: Readings in the Anthropology of Dietary Practices. Taylor & Francis. p. 126. ISBN 978-0-677-16090-0. ^ Kazmin, Amy (21 November 2017). "Modi's India: the high cost of protecting holy cows". Financial Times. Retrieved 5 August 2018. ^ Prashad, Vijay. "A political stampede over India's sacred cow". The Washington Post. Retrieved 4 March 2017. ^ "Beef, ban and bloodshed". India Today. 7 October 2015. ^ "Buffalo meat exports at over Rs 21K cr in 10 mths in FY'17". 27 March 2017. ^ "Nirmala slams Akhilesh, says beef exports already banned". 2 October 2015. ^ Long, Warwick (30 May 2017). "World's second-largest beef exporter bans sale of slaughter cattle". ^ Cuba bans cow slaughter. Articles.economictimes.indiatimes.com (13 September 2003). Retrieved on 19 December 2016. ^ "Beef, lean organic". WHFoods. 18 October 2004. Retrieved 18 December 2011. ^ "Eating Cooked Meat Can Distort CKD Stage in Diabetes". Retrieved 3 October 2013. ^ "Bowel cancer risk factors". Cancer Research UK. 17 December 2013. Retrieved 12 September 2016. ^ American Institute for Cancer Research (2007). Food, Nutrition, Physical Activity, and the Prevention of Cancer: a Global Perspective. p. 116. ISBN 978-0-9722522-2-5. ^ Xue XJ, Gao Q, Qiao JH, Zhang J, Xu CP, Liu J (2014). "Red and processed meat consumption and the risk of lung cancer: a dose-response meta-analysis of 33 published studies". Int J Clin Exp Med (Meta-analysis). 7 (6): 1542–53. PMC 4100964. PMID 25035778. ^ "Harvard School of Public Health – Healthy Eating Pyramid". Hsph.harvard.edu. 14 September 2011. Archived from the original on 28 August 2008. Retrieved 18 December 2011. ^ Micha, R.; Wallace, S. K.; Mozaffarian, D. (2010). "Red and Processed Meat Consumption and Risk of Incident Coronary Heart Disease, Stroke, and Diabetes Mellitus: A Systematic Review and Meta-Analysis". Circulation. 121 (21): 2271–83. doi:10.1161/CIRCULATIONAHA.109.924977. PMC 2885952. PMID 20479151. ^ Siri-Tarino, P. W.; Sun, Q.; Hu, F. B.; Krauss, R. M. (2010). "Meta-analysis of prospective cohort studies evaluating the association of saturated fat with cardiovascular disease". American Journal of Clinical Nutrition. 91 (3): 535–546. doi:10.3945/ajcn.2009.27725. PMC 2824152. PMID 20071648. ^ "USDA Emerging Issues" (PDF). Archived from the original (PDF) on 12 January 2012. ^ Cochran, Catherine (14 January 2011). "One Great Burger expands ground beef recall". USDA.gov. Archived from the original on 31 May 2013. ^ McIntire, Richard J. (5 February 2011). "California firm recalls ground beef". USDA.gov. Archived from the original on 31 May 2013. ^ "Kansas City firm recalls beef products". CNN. 10 March 2011. ^ Warner, Jennifer (15 August 2011). "E. coli in Southeastern US". WebMD. ^ Lindenberger, Joan (31 May 2011). "Michigan firm recalls ground beef". USDA.gov. Archived from the original on 31 May 2013. ^ "Tyson recalls beef over E. coli concerns". Reuters. 28 September 2011. ^ "Tyson recalls beef due to E. coli contamination". The Wall Street Journal. 16 December 2011. ^ "Hannaford Supermarket recalls hamburger". wickedlocal.com. 7 January 2012. Archived from the original on 14 January 2012. ^ "XL Foods recall was product of preventable errors, review finds". Retrieved 30 January 2018. ^ Agency, Canadian Food Inspection (31 October 2011). "Food Safety - Independent Review of XL Foods Inc. Beef Recall 2012". www.foodsafety.gc.ca. Retrieved 30 January 2018. ^ "Timeline: BSE and vCJD". NewScientist.com news service. 13 December 2004. Retrieved 10 August 2007. ^ Fletcher, Anthony (4 May 2005). "Canadian beef industry loses patience over border dispute". Foodproductiondaily.com. Retrieved 18 December 2011. ^ Mcneil, Donald G. (30 June 2005). "reported Case of Mad Cow in Texas Is First to Originate in U.S." The New York Times. ^ "Oprah transcript from recording 15 April 1996". Mcspotlight.org. 15 April 1996. Retrieved 18 December 2011. ^ "Food and Feed Safety, TSE/BSE". Archived from the original on 5 March 2016. Retrieved 27 September 2015. ^ "Regulation No 999/2001". EU. 22 May 2001. Retrieved 28 September 2015. ^ "EU Commission Regulation No 56/2013". EU Commission. 16 January 2013. Retrieved 28 September 2015. ^ "World Beef Exports: Ranking Of Countries".